A field that encompasses everything from software programming and web development to computer security and network administration, computer science is a popular prospect for students who are interested in technology and want to work in a high-paying and rapidly growing field. The Bureau of Labor Statistics (BLS) reports that job prospects for computer science professionals will grow by 17% from 2014 to 2024, meaning now is a great time to earn a degree in the field. Many computer science jobs are performed remotely, making the degree ideal for online study. Accordingly, dozens of schools offer online masters computer science programs that don’t require students to set foot on campus. Graduates of online masters computer science programs can easily find work in the IT field, but the increasing prevalence of computer technology in nearly every commercial industry means that computer science skills can be applied to jobs in an even wider range of professions. In fact, many top positions in industries such as design, marketing, and analysis already call for an understanding of the intersection between industry-specific topics and fundamental concepts of computer science and programming. An online computer science masters program will help you ramp-up your skillset and advance in your field. 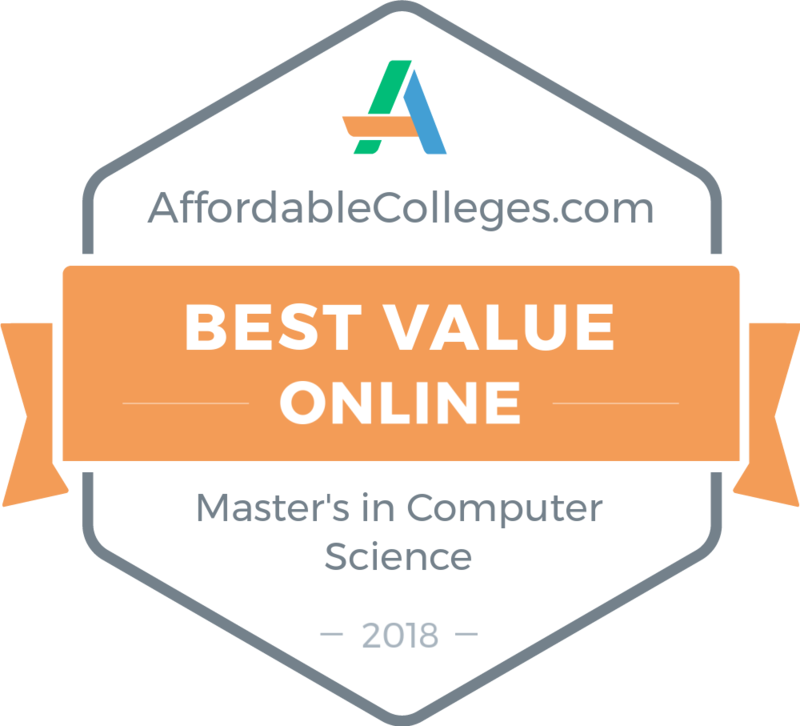 The schools on this list rank among the most affordable for online masters in computer science degrees. Giving students the ability to complete their education quickly and conveniently, these schools offer academic programs that won’t saddle students with crippling amounts of debt after graduation. Explore our ranking below to find information on each school’s program offerings, financial aid options, and more, and take the first step in starting your career in computer science today. KSU's online master's in information technology degree is offered through the College of Computing and Software Engineering. This program is designed for those who want a career in managing and overseeing information systems planning, development, implementation, and operations. Students can customize their program with focus areas in IT security, health information technology, databases, and networking. Online courses are accredited by the Southern Association of Colleges and Schools (SACSCOC) and held to same standards as on-campus. Courses also undergo a review process every three years through the Quality Matters program. Classes are taught by full-time faculty with real-world experience and academic credentials, and students have access to virtual resources like online library resources, online tutoring, and virtual writing center sessions. KSU is one of the 50 largest public universities in the country with over 70 fully online degrees, and over 130 countries represented in its student body. The university was elevated to a research-level institution by the Carnegie Classification of Institutions of Higher Education in 2015. Located in Americus, Georgia, a small-town community, GSW was founded in 1906. GSW offers an online master's degree in computer science that is approved by SACSCOC. Elective courses are available in data mining, advanced software engineering, advanced computer graphics, and more. An internship is optional, and the number of required electives is reduced by half with the thesis option. Online course curriculum is designed based on on-campus courses and optimized for distance learners. About 76% of faculty have a PhD or terminal degree in their field. GSW offers rolling admissions, and all accepted students are provided access to Microsoft Office 365 tools. GSW alumni include former President of the United States and Nobel Peace Prize recipient Jimmy Carter and former First Lady Rosalynn Carter. TAMUCT offers a master of science in information systems program (MS-IS). This degree is designed for students with either a bachelor's in information systems, a degree in another area but with some information systems skills, or those with a degree who are looking to develop a new set of skills. Students can choose from a thesis or non-thesis option. Graduates are prepared to integrate information systems and business processes into a variety of organizations and enter careers in IT project management, application development, programming, and many other fields. Courses are accessed through Blackboard and taught by the same faculty as on campus. Students have access to Tutor.com, an online tutoring platform that offers students free online tutoring support from their peers in over 40 subjects. For those who want to stay in touch with campus life, Texas A&M's "WarriorTV" offers live-streaming of many on-campus events. The SACSCOC-accredited TAMUCT currently serves the central Texas region and currently enrolls over 2,500 students. ECU offers a computer science master's degree or a network technology master's degree to qualifying domestic and international students. The CS program covers the theory and practice of software design and hardware construction. Students also learn programming languages (including C#), operating systems, hardware, database environments and software engineering tools like Rational Rose. The Network Technology program offers four tracks, including an online information security degree, a computer network management degree, a digital communication degree, or a web technologies degree option. Distance learners can access a self-paced online orientation, along with links to online resources like Blackboard and advisor contact information, an online book store, and the Joyner Library online. ECU recently earned its fifth consecutive Higher Education Excellence in Diversity award from Insight into Diversity magazine. ECU provides reduced tuition rates for in-state and active military students. UWG offers a fully online MS in applied computer science. The SACSCOC-accredited program includes coursework in web technologies, program construction, software development, database systems, system and network administration, and two project experiences that integrate academic study with real-world experience. Online courses may be asynchronous or synchronous. Distance learners offers Office 365 Pro Plus to all enrolled students, with access to student IT services for help with software and hardware issues. UWG Was founded in 1906 and achieved university status in 1996. Accredited by SACSCOC, the University System of Georgia named UWG its Institution of the Year in 2015. DSU was founded in 1881 as teacher education institution. Students can apply for the MS in applied computer science program, which emphasizes both theoretical and hands-on applications. Students take elective courses in an emphasized area of interest (such as information assurance or analytics). In-demand job paths include cyber security, software development, and many others. This degree can also be used to transition into the doctorate program in applied computer science at DSU. Online courses are taught by the same faculty as on-campus, and students may reach out at any time to a team of dedicated online staff members. Online students pay a cost-per-credit tuition rate. Overall job placement rate for DSU graduates is 94% across majors. All DSU programs are accredited by the Higher Learning Commission. OSU's William S. Spears School of Business offers an online master's degree in management science and information systems (MSIS), as well as a master of science in business analytics (MSBA). The MSIS program is designed for IT and business professionals who are looking to deepen their business and IT knowledge and stay up-to-date with emerging innovations in the field. A variety of reserved scholarships are offered to students in the MSIS program. The MSBA program, which offers hands-on experience with data analysis and exposure to SAS software and other cutting-edge platforms, is rated as the 13th best program in the country by TechRepublic. OSU is a designated Center for Academic Excellence in Information Assurance Education and Research by the DHS and NSA. OSU hosts its own, streaming TV channel online, which covers university sports, events, and interviews with reputable figures from in and outside the university. The university enrolls more than 35,000 students on its five campus locations and online, with students from all 50 states and 120 countries. WGU is a competency-based, fully online and nonprofit university designed in 1995 by 19 U.S. governors with the explicit goal of expanding access to post-secondary educational opportunities. WGU offers an MS in cybersecurity and information assurance. The curriculum is created with input from WGU's IT program council and also integrates the 2014 National Initiative for Cybersecurity Education (NICE) Workforce Framework. Students complete a mix of core project-based courses, along with a culminating capstone course. Coursework also includes preparation for two professional certifications: the EC-Council Ethical Hacking and Countermeasures and EC-Council Computer Hacking Forensic Investigator. All students are automatically assigned to virtual student learning communities with students who are working on the same subject-specific assessments during a particular term. Students are also assigned a dedicated student mentor to help develop a program of study and provide guidance on learning resources. WGU is regionally accredited and is also a USDLA Best Practices in Distance Learning Award recipient. SAU offers an MS in computer and information science. The program provides a foundation in computer hardware and software, systems design, communications, and project/team management skills, with an emphasis in the networking domain. Possible career paths include information system project management, system analyst and design or development, data management, or preparation for pre-PhD and MD research assistant data managers. Online resources include LiveText, a virtual workspace that helps organize learning requirements, assessments, and a customized e-Portfolio. Successful students usually have a bachelor's degree in computer science or a related field. Over 1,208 students are currently enrolled in SAU's online courses. SAU has maintained accreditation through the Higher Learning Commission since 1929, and in 2010 also adopted the Academic Quality Improvement Program (AQIP) model of accreditation. A variety of graduate scholarships are available to online students. With a global online campus, a main campus in Stephenville, and additional locations in Fort Worth, Midlothian, and Waco, Texas, TSU offers an online MS in information systems. The degree is accredited by both SACSCOC and the Council for Business Schools and Programs (ACBSP). The program is designed for students who have either a bachelor's degree in information systems, a bachelor's in another area and some information systems skills, or those with a bachelor's degree who wish to enter a new industry. Graduates are prepared to manage information systems in business environments. This degree can be completed in under two years when students attend full time. Distance learners have access to the same student services as those on-campus, including library resources, academic advising, and student support services. Tarleton joined the A&M University system in 1917 and now serves close to 11,000 students in 220 Texas counties, 41 states, and 24 foreign countries. UH-Victoria's MS in computer information systems is offered through the Arts & Sciences department, which is a member of the Microsoft Academic Alliance and the Oracle Academic Initiative programs. This online master's in information technology program is ideal for students who want to work in a variety of roles in a business setting. Potential career paths include programming; technical or management positions such as a software engineer, help desk rep, and web developer; and several other options. The program, which is accredited by SACSCOC and AACSB International, was designed as an interdisciplinary degree for students interested in both computers and business. All faculty are experts in their field and come from all over the world. Online master's in information technology courses are recorded using lecture-capture software and made available to online students 24/7. UH has locations in Victoria and Katy, Texas, and is part of the University of Houston network. Founded in 1973 with just 100 students, the university has grown to over 4,000 students. UIS offers a master's degree in computer science geared towards professionals who are interested in design, analysis, and implementation of software programs. Students must meet a set of computer science prerequisites (including courses in computer programming, data structures and algorithms, programming languages, and others), but may be accepted on conditional status. All students must maintain a B- or better in all core courses. UIS is designated as a National Center of Academic Excellence in Cyber Defense Education by the NSA and DHS and participates annually in the Cyber Aces Championships, with top performers in select online courses earning an invitation. UIS is one of three campuses of the University of Illinois system. Currently, students can choose from 16 fully online degree programs that are taught by the same faculty as on campus, with half of all UIS students taking at least one online class each semester. Located in Columbus 100 miles southwest of Atlanta, CSU provides an MS in applied computer science through the TSYS School of Computer Science. Students can choose from several tracks, including an online information security degree, a modeling and simulation degree, a software development degree, or a traditional track. All students complete an exit survey and comprehensive exam. Graduate career paths include software engineers/architects, computer programmers/software developers, and information security officers, to name a select few. CSU is a partner with the Southern Regional Education Board's Electronic Campus, with consistent and quality online instruction available to students throughout Georgia and qualifying states. Distance learners have access to online library resources, including a list of subject librarians and contact information of over 100 journals through the GALILEO collection. Renamed Georgia Southern University (from College) in 1990 after its enrollment doubled in seven years, GSU has invested $250 million in new facilities and offerings, including online learning. The SACSCOC- and ABET-accredited computer science master's degree provides a focus in data and knowledge systems; this degree is the only one of its kind in Georgia and of a handful across the country. The program covers areas of speech and vision recognition, expert systems, data mining and data warehousing, and online search engines. Full-time students can complete the program in less than two years. Students without a background in computer science can complete online courses through GSU to qualify for admission. GSU uses the Georgia Online Virtual Instruction Enterprise Wide (GoVIEW), which provides a shared point for courses taken across state institutions. As the state's largest higher education institution, GSU serves over 20,000 students from 49 states and 86 countries. GSU has been named one of the most military friendly schools in the country by G.I. Jobs magazine for the fourth consecutive year. UW-Stout is classified as a polytechnic school, and identified as career-focused university that combines applied learning with liberal arts education. UW offers an MS in information and communication technologies with five areas of emphasis: computer networking, digital marketing technology, enterprise technology (eCommerce), learning technologies, or visual communications. The program includes study of historical, philosophical, social, multicultural, and political influences of ICT on the global economy, as well as current issues and trends. Students learn how to plan, evaluate, and revise ICT systems and conduct research, and also have the option to work towards the Wisconsin DPI Technology Coordinator License. A cumulate e-portfolio created throughout the program is often used by students when job searching. UW students can apply for a unique customized instruction scholarship, designed specifically for online learners. Students have access to the same services as on-campus, including financial aid, disability, and veterans services. UW-Stout was the first higher education institution to receive The Malcolm Baldrige Award in 2001, which is given by the President of the United States to businesses and to education and health care organizations that are judged to be outstanding. ASU offers an SACSCOC-accredited online master's degree in applied technology (MSAT), which prepares students for careers in private industry, education, government, or health. Students choose a general or business track and learn how to design, implement, and manage technology, from instructional design to cyber security to database management. Classes are taught asynchronously, with set deadlines for assignments accessed through the Blackboard LMS. Online students have access to the ASU library, bookstore, and technology services via ASU online. For students who wish to stay involved, ASU publishes a digital ASU Today Magazine each semester in an interactive and easy-read format that gives updates on projects, awards, and other university news. Founded in 1867 in Marion, Alabama -- now located in Montgomery -- ASU was originally a school for African Americans, and now welcomes students from all racial and ethnic backgrounds. Located in Orlando, Florida, UCF is the nation's second-largest university and consists of 13 colleges, hosting more than 63,000 students from all 50 states and 150 countries. UCF Online offers an MA in instructional design and technology. This innovative degree is a newer domain that integrates computer science skills and prepares students to fill needed roles as designers of instructional materials for online, blended, and conventional learning environments in business and industry, as well as PK through higher education. Online coursework is held to same standards and taught by the same faculty as on-campus. Some elective options may only be offered on campus. Distance learners are assigned an online student success coach who serves as an advisor and academic guide and can assist students with transferring to the university. The master's degree in computer science from UWF offers focus areas in database systems, software engineering, or computer science. Students in Database Systems learn database programming and SQL. Those in software engineering learn how to analyze, design, implement, and validate software project management for customized software systems. The CS option blends instruction in systems and networks, AI, data analytics, programming languages and compiler construction, and security. Students in all tracks may complete a thesis or capstone project. Synchronous courses are offered using Elluminate, allowing students to attend live lectures with instructors and peers. Qualified residents of Alabama are offered a special out-of-state tuition rate. Founded in 1963 in Pensacola, UWF has multiple locations throughout northwest Florida, with 25 master's degree programs and more than 200 courses online. In January 2016, the the College of Science and Engineering received the largest gift ($5 million) from a living donor -- Harold E. 'Hal' Marcus -- which the school is using to fund technological updates to its facilities and degree programs. Part of the University of Maryland higher education network, UMUC offers a variety of master's degrees in computer science, including: information technology, biotechnology data analytics, cybersecurity management and policy, and cybersecurity technology. The IT degree offers multiple areas of focus, including homeland security management, informatics, software engineering, and several other tracks. Curriculum is designed to help students prepare for certification exams, including Microsoft Certified IT Professional (MCITP), Cisco Certified Network Associate (CCNA), and CompTIA (A+, Network+, Security+). Transfer students can get up to 90 credits for prior coursework. All programs are regionally accredited by the Middle States Commission on Higher Education. UMUC was awarded the Effective Practices Award by Pillar (the Online Learning Consortium) in 2016 for its college essentials of computer programming course. In an effort to include distance learners, the university also offers a number of online events; a recent webinar titled Interconnected and Unprotected - The Cybersecurity Dilemma -- featured discussions on cyber security in today's world. CSUF offers both a master's in software engineering (MSE) and an online master's in information technology (MSIT). Admission is competitive and applicants are assessed based on academic and professional background. Courses are asynchronous, but with set dates for assignments and assessments. Weekly expectations are usually consistent and include readings, a lecture, interactive exercises, response assignments, and peer/instruction discussions. Competitive tuition rates are offered for non-residents and graduate students may apply for an academic-based scholarship. CSU is accredited by the Western Association of Schools and Colleges and is a major regional university in the Orange County and Los Angeles metro area. The school hosts students from 81 nations, with almost 40,000 students currently enrolled across programs. This UMass campus is located in Lowell, the birthplace of Jack Kerouac and heart of the Industrial Revolution. UMass offers both an information security master's degree online and an online master's in information technology. The online information security degree offers concentrations in cyber security, critical infrastructure protection, homeland defense, international security, or industrial and economic security. The degree in IT is designed for students with a bachelor's degree in IT or working professionals who want to advance their studies and career. All programs consist of 10 courses in their chosen field. Students in security studies also complete a capstone research paper. Students can test drive a UMass online course through the Blackboard LMS. Classes are taught by both expert full-time faculty and adjunct faculty who are practicing professionals, and students have access to technical support services 24 hours a day. UNT offers a SACSCOC-accredited MS in information science via UNT's Web Institution. The program is designed to prepare students for careers as information experts in a variety of agencies, such as Internet service providers, web search portals, information processing services, or electronic publishing. Students learn how to work with archives and records management, as well as digital imaging technology. Full- and part-time admission is available. All students have access to courses and tutorials through Lynda.com, as well as to Office 365 ProPlus tools. The Toulouse Graduate School offers some fellowships and scholarships, which may even include health benefits; short-term emergency loans are also available to graduate students. UNT was founded in 1890 and is located in Denton, Texas, 36 miles north of Dallas-Fort Worth. UNT is a public research university, with faculty who have been awarded NSF CAREER Awards, Fulbrights, Guggenheim Fellowships, and Pulitzer nominations. Towson University is located in Towson Maryland, just north of Baltimore and close to Washington D.C., with an additional five off-campus locations throughout the state. The fully online MS in applied information technology is one of the most popular graduate programs; students learn to design, create, and implement information systems as solutions to workplace challenges. Students gain or advance their skills in a variety of areas, including database management, information security and assurance, internet application development, software engineering, and others. An independent study or case study project is optional and granted with permission. The program is accredited by the Middle States Association of Colleges and Schools. About 78% of full-time faculty hold a PhD or the highest degree in their field. Towson University's Emmy-award winning radio station, WTMD FM (89.7), can be streamed online and has one of the largest listening audiences of any public radio station in Maryland. The computer science master's degree from NC State at Raleigh is designed for professionals in the field who are living in the U.S. or are active military service personnel abroad. There is no thesis or comprehensive exam required, and most students take one or two courses each semester. Courses usually consist of campus-recorded videos of lectures, and all assignments and requirements are identical to the on-campus degree. NC State graduates rank among the top 20 most desired by job recruiters. NC State was founded as a land-grant institution in 1887 and has grown into a renowned research university with over 34,000 students. The university's Hunt Library, which offers access to resources for distance learners, has been named by Time Magazine as "the library of the future". Missouri S&T has been accredited by the Higher Learning Commission since 1913. S&T's Global Learning division has been delivering courses via distance education since 1974. The master's degree in computer science has an emphasis in either critical infrastructure protection or software engineering. Critical infrastructure focuses on skills needed to protect and maintain the stability of of the nation's infrastructure, while software engineering covers everything from assessment of software quality and testing to process improvement and algorithm theory. A thesis is optional, and most students complete program requirements in three to four years. Most courses are asynchronous; live presentations or projects may be required, but students are informed well in advance. Missouri S&T has been noted as a best investment public university for out-of-state students by Newsweek. Founded in 1889, UI has campus locations throughout Idaho and extension offices in 42 counties. The university's MS in computer science (with a thesis or non-thesis option) is offered through its Engineering Outreach department. Graduates are prepared to apply computer concepts to organizational applications in science, engineering, business, or academic environments. Course lectures are recorded in the classroom and streamed in a high-resolution MP4 format, and students can survey a demo course session before applying. Students can choose their own proctor for monitoring exams. Nonresidents pay the same per credit fee as residents of Idaho. Old Dominion offers an MS in computer science, with courses offered in bioinformatics, data mining, high performance computing, cyber security, and others. Courses may be synchronous or asynchronous, and practicums and internships may be options and completed within a close radius of the student. ODU is located in Norfolk, Virginia, with three extended campuses throughout the state. The university is a pioneer in online learning technology, and began offering its online programs in the mid-1980s. To date, over 11,000 online degrees have been conferred. About 51% of online students attend full time and 64% work 30 or more hours per week. A recent survey shows that 97% of computer science graduates were satisfied or very satisfied with the quality of faculty in their major. All programs are accredited by SACSCOC. Founded in 1865 in Orono, Maine along the Stillwater River, UMaine has been ranked among the top public universities for research by the National Science Foundation. Students will find a fully online master's degree in information systems, offered through the university's flagship campus. The degree program places a focus on the technical, management, and policy issues related to implementing and maintaining computer-based systems for today's workplaces. Students with a bachelor's degree in any field are encouraged to apply. Electives may be chosen from several areas, including business, education, computer science, electrical and computer engineering, spatial information science and engineering, and more. No thesis is required. The information systems program has a rolling admission deadline. In addition, juniors at any University of Maine campus may apply for this program before their junior year and take courses towards the master's degree, with the ability to finish the master's after finishing an undergraduate degree in only one year. Scholarship opportunities are available for out-of-state and transfer students. Bellevue offers an MS in computer information systems. Students become familiar with a wide variety of computing technologies, including organizational information systems, systems infrastructure, storage systems, software methods and technologies, and more. Graduates are prepared to work in a diverse set of environments, from educational institutions to industry to government. Program concentrations include databases, software development, or security. Courses are asynchronous and professors use a mix of multimedia tools to deliver course lessons. Students also have access to 24/7 online library resources, online tutoring, and tutorials. Overall student ranking for the program (based on an average of 1,739 surveys completed by students taking core courses related to the major) is 4.5 stars. Located just outside Tampa, with 17 continuing education centers throughout the state, Saint Leo University is the oldest Catholic institution of higher education in Florida. Saint Leo's information security master's degree online has a focus in cybersecurity. Graduates are prepared to work as information security and assurance professionals, and to complete advanced research in the field. Students develop solid skills in operating systems and networking and learn the technical aspects of information security by applying security policies, software applications, distributed secure system architectures, cryptography, and other tools. Curriculum is aligned with the core curriculum as suggested by the National Security Agency (NSA). Saint Leo maintains several corporate partnerships and employees may receive a tuition reduction. Students may transfer past college credit and be eligible for prior learning through military service, employee training, or non-credit courses or volunteer opportunities. Purdue's MS in computer science degree is offered through Purdue's Engineering Professional Education Division (ProEd) and is designed for students with a bachelor's degree in computer science or engineering as a non-thesis degree. Curriculum includes a mix of statistics and computer science topics. Online courses are asynchronous but held to the same standards as those on campus. Purdue currently hosts almost 350 graduate students in its CS program, with most receiving some form of financial aid. Online students receive free access to Microsoft Office 365 tools, as well as online library resources. Purdue has a number of internationally recognized and reputable alumni, including Ward Cunningham, a computer programmer who wrote the first Wiki application. Located in Ames, Iowa, ISU hosts students from all 50 states and over 100 countries, with almost 6,000 graduate students. Iowa State offers a master of engineering (MEng) in computer engineering, as well as an MEng or an MS in information assurance (security). Most students take one class per semester and finish their degree in five years. Research areas for CE include advanced electronics and materials, communication, computing and networking systems, energy systems, reliable computing, and software systems. The online information security degree includes a thesis option or final capstone project. To help further research efforts, the online learning department facilitates virtual meetings and collaborations for College of Engineering departments, research centers, and student organizations. Job placement rate for graduates is 95% within six months of program completion. Iowa State is home to the world's first electronic computer, invented by alumnus John V. Atanasoff, as well as to Cyence, the university's newest supercomputer capable of performing more than 183 trillion calculations per second. SUNY Polytechnic Institute offers an MS in information design & technology that allows students to integrate emerging media, modern culture and communication with a chosen area of research that aligns with a student's career goals. The program places emphasis on social impact and potential applications of new communication technologies. Potential career paths are broad and include instructional media, web development and design, social media strategy, internet research, public relations, blog/wiki design, and many others. There is a focus on understanding how to analyze and evaluate new information design technologies, with some opportunities for using software in courses. Courses are asynchronous and students can demo an online course at any time. Most online students are working and enrolled part-time, taking one or two courses per semester. Located in Utica, New York, SUNY Polytechnic Institute was formed from the merger of the SUNY College of Nanoscale Science and Engineering and SUNY Institute of Technology. All programs are accredited by the Middle States Association of Colleges and Schools. USF offers an online MS in cybersecurity with an interdisciplinary focus, as well as an online master's in information technology. The MS in cybersecurity includes core courses in disaster recovery, applied cryptography, data networks, and more. Students choose from one of four focus areas: cyber intelligence, digital forensics, information assurance, or computer security fundamentals. The IT Program prepares students to problem solve and implement IT solutions in an organizational setting. Both programs are designed for students who have some familiarity with computer networks, program, and algorithms, and an undergraduate degree in computer science, computer engineering, management information systems, or IT is recommended for admission. Most courses are structured in eight week periods. USF is located in Tampa, close to U.S. CENTCOM and U.S. SOCOM at MacDill Air Force Base, with strong connections to cybersecurity expertise. Scholarships and fellowships are available for graduate and transfer students. UMass-Dartmouth's master's degree in computer science is available online with a focus on software development. Students without an undergraduate degree in a related field may complete four computer science fundamentals online in one year to qualify for admission. Coursework includes hands-on work with realistic scale projects, and students complete a master's project working one-on-one with a faculty member. Course examples include mobile robotics, advanced bioinformatics, software system design, and more. Courses are asynchronous and taught by UMass faculty and experts from the field. Almost 400 students are currently enrolled in UMass' online programs, and students receive one-on-one advising and access to online tutoring and writing center services.All programs are accredited by New England Association of Schools and Colleges (NEASC). Founded in 1891 as one of three original UNC schools, University of North Carolina at Greensboro is now part of the 17-campus UNC System. The SACSCOC-accredited MS in information technology and management online program is designed for IT professionals looking to move into a management position, or for managers who want to ramp up their IT knowledge. Students may choose an optional concentration in business analytics. Courses may be synchronous or asynchronous, and online faculty are both educators and experts in their field. Online students receive reduced tuition rates. Students can also take advantage of UNC's Career Services Center to prepare for job placement after graduation. CSU offers both an MCS and an MCIS degree. The MCS program is designed for professionals in the field who are looking to advance their skillsets. MCS alumnus have gone on to work for companies like Microsoft, IBM, Intel, and Lockheed-Martin, to name a few. The MCIS program provides advanced study in IT, project management, and business systems, preparing students to oversee computer CIS and train employees on the newest technologies in a wide range of organizations. Almost 100% of graduates of the MCIS program are placed in the IT field and have some of the highest beginning salaries of all CSU graduates. CSU online students pay the same per credit fee, regardless of state of residence. CSU is located in Fort Collins, about an hour's drive from Denver. UofM has been offering online degree programs since 1995, with more than 40 programs currently available. Founded in 1912, UofM's blue and gray colors were selected in commemoration of the reunification of the two opposing armies during the Civil War. The university's MS in applied computer science is designed as an interdisciplinary degree. Students learn how to assess and evaluate cutting-edge technologies and implement them to solve today's challenges in the workplace. The program includes a final capstone project that represents the student's ability to integrate technology in a real-world situation. Courses are asynchronous, but students have opportunities to interact live with their peers and instructors through video software and discussion boards. UofM is also home to the Center for Information Assurance, a nationally designated Center of Academic Excellence in Cyber Defense Education that recently hosted the 10th annual Cyber Security Summit at the FedEx Institution of Technology in October. Founded in 1922 and located in Murray, Kentucky, and with regional campuses throughout the state, Murray State enrolls almost 2,000 graduates, along with 775 international students from 59 countries. Murray's MSIS program covers a broad range of topics, including software development, information management and security, information systems architecture, systems planning and analysis, and more. Graduates are prepared to enter a diverse range of organizations and to design and implement the information resources necessary to manage and secure company assets. Students with any bachelor's degree are encouraged to apply. The program can be completed in as few as 15 months. In 2013, Murray was accepted as a University Alliance partner with SAP, a global program that allows institutions to take advantage of powerful SAP software that is used by organizations like NASA. The MSIS degree is accredited by AACSB International, as well as by SACSCOC. Concordia University-Wisconsin offers an MS in information technology, designed for both current IT professionals and new college graduates. Admissions are rolling and students can begin the program at any time. Students learn how to implement and maintain information systems on devices ranging from mobile phones to supercomputers. In addition to knowledge of how to create and use database management systems, students learn how to think through the creation process as a user and applying ethics and codes of practice set by the Association for Computing Machinery and the Institute for the Management of Information Systems. Courses are self-paced and include guidance from instructors who are currently working in the field. All students are assigned a dedicated online student success advisor, who provides support throughout the program. Concordia University's main campus is in Mequon, along the shore of Lake Michigan, with 10 additional locations throughout the state. The university is associated with the Lutheran Church Missouri Synod and the greater Concordia University System. More than 2,400 online students are currently enrolled in Concordia's online programs. Regis University was established in 1877 in Las Vegas, New Mexico, before moving to its present location of Denver in 1887. Several master's degrees are offered in computer and information sciences, including an online information security degree. Additional degree options include data sciences, database technologies, healthcare informations and information management, information technology management, software engineering, and systems engineering. Programs include both a capstone project and practicum experience. Regis offers a number of grants and scholarships, and funds are available to undocumented students based on academic and other talent-based criteria. Regis is a designated Center of Academic Excellence in Information Assurance Education by the National Security Agency and the U.S. Department of Homeland Security. As a Jesuit University, Regis is committed to the principles of personal reflection and social justice. Regis was also recognized as "One of the best in America at tending to the needs of adult learners" in the book What America Does Right by Robert H. Waterman. GMU is Virginia's largest public research university with over 34,000 students. About 80% of students are employed within six months of graduation. GMU offers an MS in applied information technology (AIT) and cyber security, which bridges the domains of systems engineering and software engineering. There are two admission periods offered during the year, and part-time enrollment is available. The AIT degree provides knowledge in the design, evaluation, and implementation of major data-based systems in the public and private sectors. The program is designed for professionals who hold a bachelor's degree, have been in their designated field for 5 to 12 years, and have some IT knowledge. Online courses are taught by the same faculty as on-campus, and students have access to the same student services, including the online library and writing center. As of fall 2016, University of Alabama has offered an MS degree in information systems. Students learn both the management and technical aspects of information systems and are prepared to take management or executive-level positions in the field. In addition to learning how to design, implement, and maintain informational systems, graduates leave with knowledge of business analytics and data management tools. Full-time students can complete the program in one year. The College of Business Administration is accredited by AACSB International. Students in the program also have access to SAP software, used by both NASA and the Army Aviation and Missile Command. UH is also home to an information technology and systems center, founded 20 years ago, which is dedicated to using the latest computer technologies to advance science and benefit society. Excelsior College offers an MBA in either cybersecurity management or technology management. Students in the cybersecurity program gain knowledge in the areas of IT risk assessment, cybersecurity law and ethics, cyber attacks and defenses, mobile and cloud security, and cybercrime and cyberterrorism. The technology management program is geared towards students who have past experience in military, business, or other nonacademic environments. Students can join learning communities through MyExcelsior and start study groups or collaborate with peers. Approximately 98% of Excelsior's almost 2,200 graduate students complete their program to completion. Excelsior was founded in 1971 as a nonprofit institution and is located in Albany, New York, with a center in Washington, D.C. that is also home to The National Cybersecurity Institute. Accredited by the Middle States Commission on Higher Education, Excelsior has also received specialized accreditation for its business programs through the International Assembly for Collegiate Business Education (IACBE). The college is also is recognized as a Center of Academic Excellence in Cyber Defense Education by the NSA and DHS. FSU's online master's in information technology provides core coursework in management of information organizations, user needs assessment, information systems management, and usability analysis. Students customize their program by choosing one of the following areas of specialization: technology and networking, large-scale data management, user-centered design, web design, and leadership and management. Students may also develop a customized specialization based on their professional goals. Courses are usually synchronous and offered one night a week. Most online master's in information technology students complete the program within two years, but have up to seven years to complete their degree requirements. Distance learners have access to a number of digital resources, including library services, Lynda.com tutorials, a virtual computer lab, and more. Market rates, which are based on a survey of the costs of similar programs offered by like institutions, may be available for select courses. In addition, students who are a residents of a Southern Region Educational Board state and who do not have access to a similar program within their home state can attend through the SREB Academic Common Market for reduced tuition rates. The UofM was founded in 1959 through a donation from the Ford Motor Company and maintains accreditation by the Higher Learning Commission. An online computer science master's degree is offered with a choice one of the following concentrations: computer graphics, geometric modeling and game design, computer networks and security, information systems, systems software, software engineering, database management, or web technology. Students stream recorded classroom lectures, participate in group projects, and receive feedback from instructors. Course standards and assignments are the same for on-campus and distance learning students. A free MATLAB software license is provided to all computer science students. UofM maintains a number of high-profile research partners, including the Department of Defense, General Motors, and the National Science Foundation, to name a few. Through exclusive partnerships with AT&T and Udacity, Georgia Tech offers an online MS in computer science. This cost-competitive program (total tuition is about $7,000) attracted over 3,000 computing professionals in spring of 2016 from over 80 countries. This program offers a unique opportunity to collaborate and network with a global community of professionals. Specializations are offered in computational perception & robotics, computing systems, interactive intelligence, and machine learning. Students working full-time may take up to two courses per semester, and the typical time for program completion is three years. Georgia Tech is one of the world's foremost leaders in science and technology research, and is associated with the Georgia Research Tech Institute, which employs thousands of scientists pioneering government and industry solutions, machine services, professional education, and other research initiatives. The school boasts several well known alumnus, including Shane Kimbrough, who was recently appointed as the new commander of the International Space Station. Marist College was founded in 1929 in Poughkeepsie, New York, along the Hudson River between New York City and Albany, and now offers international programs in 31 countries. Marist's MS in information system provides both technical and management skill coursework. The program is designed for IT and business professionals looking to advance their IT skills and become leaders in their field. Team projects are often used to enhance students' systems thinking and interpersonal skills. Many courses also utilize real client-based projects to provide students with real consultative experience. Students may choose an emphasis in information systems management (ideal for those looking to become a CIO), business analytics (geared towards aspiring CDOs), or computer networks and security (the option for future CTOs). Courses are asynchronous and offered through Marist's iLearn platform, which students can demo at any time. Marist maintains a joint partnership with IBM, and both institutions routinely participate in emerging technology research projects in both the business and academic sectors in areas that include data analytics and cloud computing. University of Maryland-Baltimore County offers an MS in information systems online, a competency-based program that can be completed in two years. The program is ideal for working professionals and out-of-state or international students. In addition to core courses, students choose from advanced electives that include topics like enterprise-wide computing, introduction to data mining, social media application and analysis, cybersecurity, and many more. A master's thesis is optional. Students may also take up to two courses outside the curriculum to fulfill advanced study objectives. UMBC also ranked fourth among U.S. research universities in the production of IT degrees and certificates, according to U.S. Department of Education data for 2014. Students may also participate in the annual HackUMBC 24-hour hackathon, in which students come together to develop innovative technological solutions to address problems that matter to them. The MS in computer science CityU is designed for veteran professionals who have been in the field for 15 or more years and have a bachelor's degree in computer science or a related degree. Specializations are offered in programming, technology management, development management, cloud development, data management/big data, serious gaming, or embedded systems. Most students complete the degree program in two years. CityU also hosts a Center for Information Assurance Education, offering both physical and online programs, research and consulting in information security for CityU students, collaborating institutions, and the public. More than 90% of alumni have described faculty as experts in their field and able to successfully integrate theory and practice into coursework. Students also have access to a scheduled webinars on various career topics through the university's events page. CityU is private and nonprofit institution and an affiliate of the National University System.